Hint: There's a ~big~ difference. It’s no secret that nurses are some of the most underpaid professionals in the Philippines. Despite their rigorous studies and tough exams, nurses get offensively small salaries. This is why we can’t blame those who aspire to work abroad, where licensed health care professionals get compensated fairly. Bee, 25, works in a government hospital in a northern province and earns around P19,000/month. She lives with her parents. I wanted a good future. How did you choose where to work? People told me working for the government had more benefits than going private. Do you feel like you’re properly compensated? No! We have to deal with a lot—from bad comments from our patients to rich brats who feel like they’re the ones paying our taxes. Are you able to save up? Which luxuries are you able to afford? I don’t have a lot of money saved, but I’m able to set aside P1,000 monthly for my emergency fund and P4,000 as additional savings. For “luxuries,” I spend P10,000 on travel, P5,000 on events, and P3,000 on my maintenance medications. Any plans of leaving the hospital you work in or shifting careers? Yup. I would really like to go abroad, but I’m still sorting some things out. Mikee, 25, works in a private hospital in Pasig City and earns around P16,000 to P17,000/month. She also lives with her parents who pay the bills at home. Nothing compares to the smile and relief that you give to suffering patients and their loved ones when they’re being taken cared of. I get to be Wonder Woman at work because I’m the first one they call for help. After getting my license, I submitted applications to a lot of big hospitals. I got accepted to some, but they required me to pay training fees. One hospital asked me to wait eight months to be interviewed, and another offered me a contract for only six months. The hospital I am currently working for (five years and counting) trained me without any fees, and I got to work right away. The starting salary was not that reasonable but at least they paid me as soon as I worked for them; my dependents and I have hospital benefits (P125,000 on hospitalization and P20,000 for outpatient medications). As a Filipino nurse working in the Philippines, my salary and benefits meet my expectations because that’s what society tells you to expect from our healthcare industry. But I really don’t think that I, and Filipino nurses in general, are properly compensated here in our country. For example, I work at the emergency room and we treat everyone who comes in—and I mean everyone, may it be five, 10, 200, or even 100 [patients]. We get kicked and spat on by psychiatric patients, get shouted and humiliated by agitated patients, and get splattered by blood trying to revive trauma patients. And we treat suspected infectious [and contagious] patients but our hazard pay is just at P250 per month. We work with doctors to revive patients, do procedures and administer medicines that took us four years and more of education, acquire multiple licenses costing us and our parents hundreds of thousands of pesos for a salary that does not even make a nurse uplift herself to the position that she needs to be in. I don’t pay the bills at home and I’m blessed for that because of my parents, but even so, I was only able to save up at least P500 monthly when I was on my second year at work. Now, I’m able to set aside P1,000 monthly as a travel/emergency/savings fund. As for luxuries, I don’t know if these count but what I can afford now are P1,000 dinner buffets and clothes and shoes that range from P2,000 to P3,000. I do have plans on being a nurse researcher or being a nurse academician. If I need to go abroad or leave my current hospital for better experience, education, salary, and career growth, I would. But one thing’s for sure, I will always be a nurse by profession and by heart. Aga, 28, worked in a private hospital in Bulacan and earned around P7,000 to P10,000/month (including overtime pay). She lives with her parents. I pursued nursing because I heard that nurses have a higher chance of working abroad where we’re paid way better. It was the first hospital to call me back. I graduated during a time whern there was a surplus of nurses in the country. No. I can't afford my needs and wants or even grow my savings while I’m earning minimum wage and taking care of household and personal needs. Not really—unless I starve myself. I have no solid emergency fund, but I try to save around P2,000 a month when the odds are in my favor. The only luxury that I can remember was when I bought a phone for P20,000, but it was worth at least two years of work. Currently making steps to leave the country. Olivia, 25, on the other hand, works in a public teaching hospital in Dublin, Ireland and earns P120,000 to P150,000/month (converted from Euro). She rents a house. Nursing was really a family thing. Most of our relatives are nurses and that is what I embraced as I grew up. After graduation, some of my friends went to med school, while others became flight attendants. I wanted to try other things besides nursing, too, but I was reluctant since I've come so far already. So I told myself to try first and if it doesn’t work out, I’ll give my other passions a chance. Fortunately, I got employed by a private tertiary hospital and eventually embraced my choice. Days are busy, but the satisfaction of hearing words like “Buti nalang ikaw ang nurse ko,” “Kung hindi ka nagtyaga, hindi siguro ako gagaling,” and “Maraming salamat, hija,” is worth all the sweat and tears. Actually, this is the only offer I pursued. I wasn’t expecting anything when I passed my resume since I lack the experience at the time. Thankfully, I got called for an interview, took my IELTS, and next thing I know, my decision letter was approved. I flew to Dublin the following week. 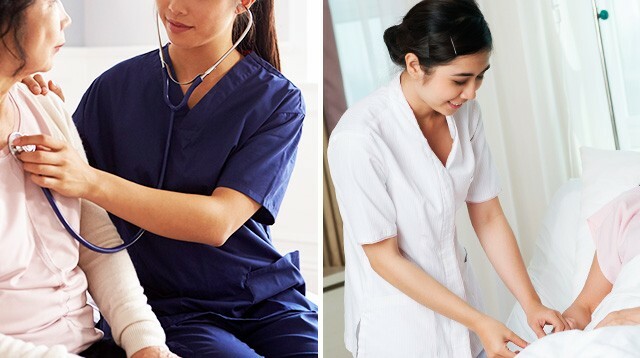 They say a nurse’s salary in Europe is still in the middle class range, but for Filipino nurses who endured a monthly salary of P10,000 to P15,000 per month at home, this is more than enough. Taxes and cost of living in Ireland are high as well, but I think it all boils down to lifestyle. If you live within your means, you will be fine. Yes, definitely. I was able to save money in the bank and was able to fly my family out of the country, which was our dream for so long. I’m able to set aside P10,000 for my emergency fund, another P10,000 for my personal savings fund, and P60,000 for a savings fund for my family. I don’t really buy expensive or branded goods. I spend my money on traveling. Planning a trip makes me feel happier and more fulfilled. How is your work different now compared to when you were a nurse in the Philippines? When it comes to work, there is really a big difference in terms of equality and respect. When I was a nurse in the Philippines, we mostly did what the doctors told us to do. But here, nurses are more independent. Doctors ask nurses if they are happy with the [healthcare] management they propose. Our decisions matter in patient care. There are even nurses with specialties like tissue viability (the one who decides which dressing to put on which wound or pressure ulcer) and pain management. I feel like I am important; I feel recognized. Any plans of leaving the hospital you work in, going home, or shifting careers? Right now, I have no plans of shifting careers, but I'm definitely staying here for a couple more years. I am also interested in pursuing post-graduate courses, which are sponsored by the hospital. Living and working abroad has its ups and downs. I just keep in mind the people I’m doing it for. Ella, 25, works in a government hospital in the United Kingdom and earns around P120,300 to P156,300/month (converted from British Pound). She rents a four-bedroom flat near the hospital with friends. I took up nursing because my original plan was to pursue medicine, but I changed my mind. A lot of Filipino nurses seek employment overseas for better pay. I chose to work in the U.K. because it was hiring foreign nurses when their hospitals were really understaffed. Compared to my salary in the Philippines, yes, I feel like I am well compensated, but if you compare it to other countries like the U.S. and Australia, the salary of nurses here is really not that high—especially if you consider the cost of living. Union groups here try to ask the government for pay raises, but it’s never approved. I make sure to set aside a certain portion of my salary every month. I don’t really buy stuff that I don’t need. If, for example, I really like something or if my friends and I plan an upcoming trip, I do extra shifts so my savings won’t be affected. In the Philippines, after a year of working in the hospital, I felt burnt out. I worked eight-hour shifts (and never finished on time) five times a week and got two weeks of annual leave per year (after the first year of working). Here in the U.K., I work 12-hour shifts three times a week and seven weeks of annual leave. Sometimes, we get four to six days off, which could allow you to travel or pursue other interests. For the British, it’s important to have work-life balance. If there is just one, big downside to working abroad, it’s fighting homesickness. I plan to transfer to the U.S. just ‘cause I have relatives there.